Emilio Mignone Lecture Asks: How Can the United States Confront Racial Injustice? The United States has not adequately addressed its racist past nor the ongoing injustice in the country. In an era of mass incarceration, police violence, economic discrimination, and the rise of revisionist narratives, confronting this failure is all the more urgent. In the year since the United States elected Donald Trump, historical falsehoods have found stronger footing, deepening social fissures and claiming yet more lives. It was therefore fitting that one year to the day after the world first awoke to a President-elect Trump, leading activists, experts, and thinkers gathered for the ninth Emilio Mignone Lecture, a discussion about whether the tools of transitional justice have a place in the US. 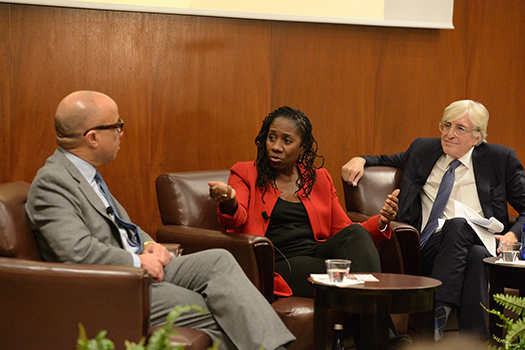 Darren Walker, President of the Ford Foundation, and Sherrilyn Ifill, President and Director-Counsel of the NAACP Legal Defense Fund, joined moderator David Tolbert, ICTJ president, in conversation. The lecture, titled “Reckoning with Racial Injustice in the United States,” was co-hosted by ICTJ and the Center for Human Rights and Global Justice at NYU School of Law on November 9th at NYU’s Lipton Hall. Walker has been an outspoken advocate for the need to face the unbroken legacy of slavery, and under his leadership the Ford Foundation has been a key contributor to public discussions of race in the United States. Likewise, Ifill has written extensively about the silence surrounding the country’s history of racism and about the struggle for structural change in the criminal justice system and beyond. Her book On the Courthouse Lawn: Confronting the Legacy of Lynching in the Twenty First Century is based on her research into public lynchings in Maryland. Tolbert is a transitional justice expert, having worked in the former Yugoslavia, Palestine, the Middle East, eastern Europe, Cambodia, Lebanon and a host of other countries. However, his roots lie in the Carolinas, where he grew up in the segregated South and has advocated for the United States to confront its own troubled past. Conversation began with introductions from NYU professor Meg Satterthwaite and ICTJ Executive Director Fernando Travesi. Satterthwaite stressed CHRGJ’s commitment to holding the United States accountable to its human rights obligations while Travesi reflected on the increasing relevance of the tools of transitional justice in the US. Walker, Ifill, and Tolbert then opened discussion, with Walker unpacking why the United States never has had an official reckoning for slavery. Discussion centered on the urgent need for a reckoning with the truth. “You have to be able to confront the truth in order to move forward,” said Ifill. “You need ways of informing the public of the uncontested nature of racial mythology in the US.” She also acknowledged that efforts to attack the concept of truth damage the possibility of justice, lamenting the need for video evidence of violence to start a conversation about racism. “Videos of police killing black people should not be necessary to spark conversation about truth.” She added: "Truth telling becomes all the more difficult when facts and truth are challenged as 'fake news.'" Ifill and Walker both stressed that poisonous mythologies persist, buttressed by the failure to grapple with its past. They noted that some people continue to argue that persistent systemic inequality is somehow inevitable or natural, a belief they say is rooted in deliberate ignorance of the past. They pointed to specific policies – from slavery to redlining, from Jim Crow to the War on Drugs – that systematically targeted people of color. By the same token, both speakers urged policy change and investment as a means to address these systemic issues, benefitting not just people of color but society as a whole. That sort of investment will not happen without pressure, though, a point Tolbert stressed at the end of the lecture. For more on what that pressure might look like, and why that change is so urgently needed, watch the full conversation here.